Home Search and Rescue Coast Guard rescues surfer, three beach patrol members off Ocean City, Md. Coast Guard rescues surfer, three beach patrol members off Ocean City, Md. 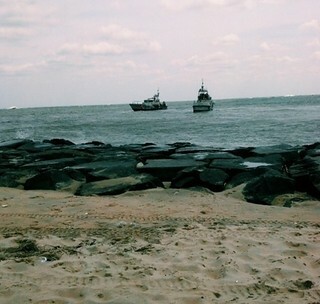 Jul 5th, 2014 · Comments Off on Coast Guard rescues surfer, three beach patrol members off Ocean City, Md. OCEAN CITY, Md. — The Coast Guard rescued a surfer and three members of the Ocean City Beach Patrol Friday after the beach patrol swimmers attempted to assist the surfer, who was stuck in the inlet. Crew members aboard two 47-foot Motor Life Boats from Coast Guard Station Ocean City, Md., rescue a surfer and three Ocean City Beach Patrol responders caught at the Ocean City Inlet. Ocean City Communications Center, contacted Coast Guard Station Ocean City Command Center watchstanders at approximately 3:00 p.m. reporting beach patrol members and a surfer were in need of assistance. It was reported the surfer was carried to the inlet by a storm current. The watchstanders diverted two 47-foot Motor Life Boat crews who were in the area conducting heavy weather training. The MLB crews arrived on scene approximately 10 minutes later and retrieved the surfer and beach patrol members. 01/13/2019 · Comments Off on Coast Guard aircrew rescues two surfers near Indian Beach, Ore.